Will it stem the flow of illegal immigrants? 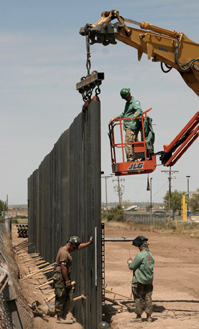 America is rushing to build 670 miles of fencing along the U.S.-Mexican border by the end of the year. The fence — or wall, as critics along the border call it — is to include 370 miles of fencing intended to stop illegal immigrants on foot and 300 miles of vehicle barriers. To speed construction, the Bush administration is using unprecedented authority granted by Congress to waive environmental-, historic- and cultural-protection laws. No one claims that building physical barriers along roughly a third of America's 2,000-mile Southern border will stem illegal immigration by itself, but supporters believe it is an essential first step in "securing the border," providing a critical line of defense against illegal migration, drug smugglers and even terrorists. Opponents see it as a multi-billion-dollar waste that will only shift illegal immigrants toward more dangerous and difficult routes into the country, while doing environmental, cultural and economic damage.